Over the next few days I am sure there will be a lot of whining from PSTA, the politicos and special interests that public transportation in Pinellas County was the victim of the Tea Party extremists. 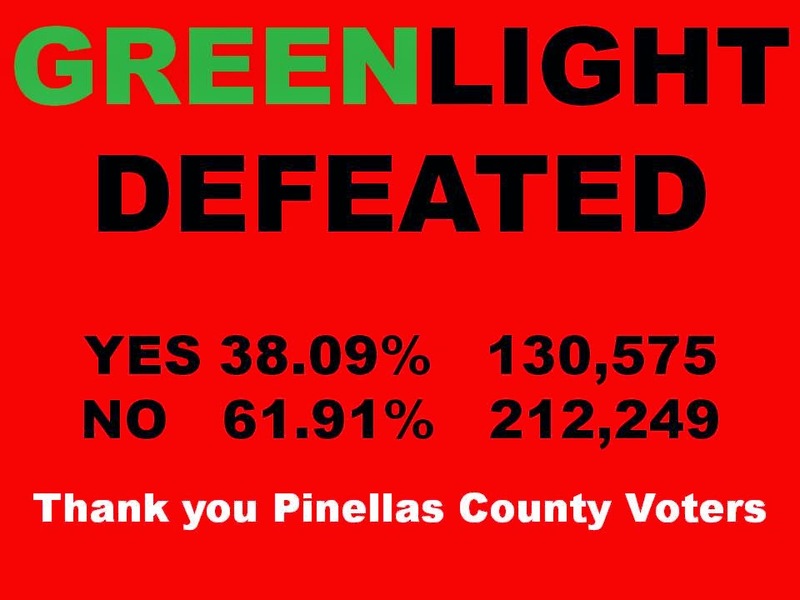 The facts are the Tea Party had little to do with the GreenLight election results and there just aren’t that many extremists in Pinellas County. The public did not vote against public transportation they voted against special interests and being taken advantage of. The Headline says it all: GreenLight defeated. Not public transportation... GreenLight was defeated. GreenLight was a badly flawed plan, a poorly constructed Ordinance that really had very little to do with real public transportation. Add to that the nefarious actions of the PSTA CEO including misusing Federal Homeland Security funds and the total inaction of the PSTA Board and there was no way Pinellas County residents had the confidence to tax themselves for ever for few buses and a 24 mile train to benefit the power players and not the public transit users. GreenLight was a victim of same approach that lead to the defeat of the LENS in St. Petersburg. What started out as serious effort to meet a public need was hijacked by special interests and over a number of years turned into a self-serving effort. No Tax for Tracks, by simply pointing out the obvious: that GreenLight was more about money, redevelopment and special interests than public transportation and sticking to that message, doomed GreenLight to defeat. The level to which GreenLight was poorly developed, planned and executed is most simply told in the fund raising numbers. Out funded 10 to 1 No Tax for Tracks brought GreenLight to its knees by simply getting the facts out. It is unlikely that any amount of money could have gotten GreenLight past the voters. There are a lot of lessons to be taken from GreenLight and I will explore a few over the next few weeks. For now there needs to be some serious soul searching at the Pinellas County Commission and some serious reorganization at PSTA. Pinellas County needs properly implemented public transportation and the only way to get it is by reorganization at the PSTA. At least now the politicians should know how NOT to go about it.